It’s one of the first questions that we ask clients when we’re helping diagnose a problem with a network resource. There are several different ways to determine your IP address. There’s even a website, whatsmyip.org which will show you what Internet servers think your IP address is. 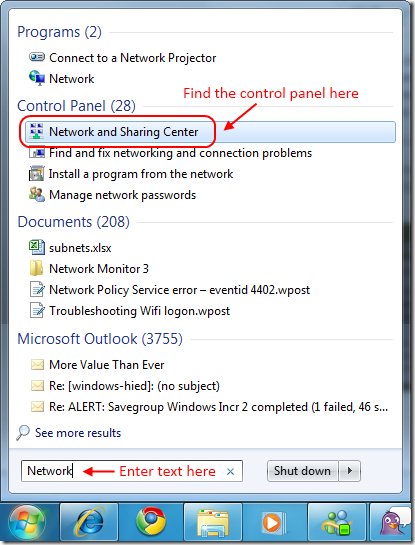 In this post, I describe how to determine your IP address(es) on Windows 7 using the control panel. You can also use the ipconfig command-line tool, but if you know about that tool, you probably don’t need me to tell you about it. 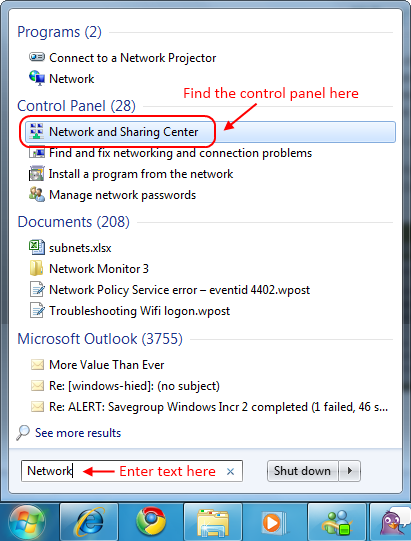 This entry was posted in Posts and tagged network, Windows7 on January 19, 2011 by Geoff Duke. I’ve been working with client to try to identify why we sometime log onto the UVM wifi network successfully before workstation logon, but frequently this fails and drive mappings are not performed successfully. This entry was posted in Worklog and tagged dhcp, network, Vista, wifi on June 4, 2009 by Geoff Duke. I haven’t watched the whole thing, yet, but it also links to video of a presentation that discusses the evolution of the ribbon interface. My son and I watched the first ten minutes or so before bed last night, and he’s interested in watching the rest. Hurray for GeekKids! I got the windump capture to work, using the local computer policy startup script setting. I did the same thing using the nmcap.exe command-line component of Microsoft’s Network Monitor 3.2. And one thing I learned is that I don’t know nearly enough about network communications. This entry was posted in Worklog and tagged kerberos, network, Office2007, Vista on April 17, 2009 by Geoff Duke. This entry was posted in Posts and tagged cli, netsh, network, Vista on July 10, 2008 by Geoff Duke.